Peter Read Miller's photography workshop returns to to Knoxville and the University of Tennessee for the Fourth exciting year. Join Peter and his friends for four days of shooting, critiquing and learning in Knoxville, TN. The workshop will begin with a Wednesday night cruise on the Tennessee River, a BBQ dinner and Peter's presentation. 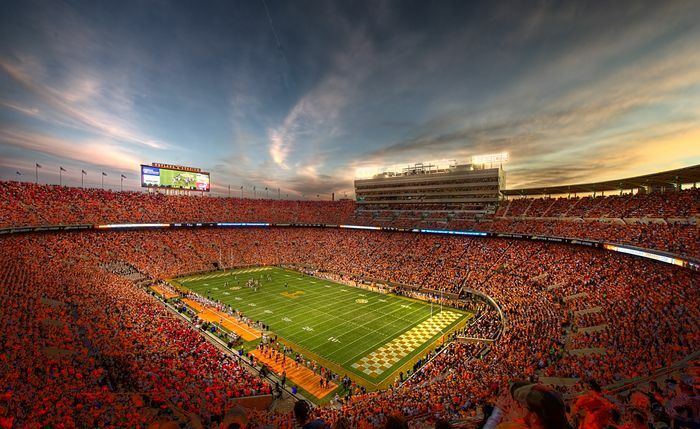 Events to be covered will include the University of Tennessee vs. The University of Texas at El Paso football game in spectacular Neyland Stadium. A Friday night high school football game between two of the top teams in the Knoxville area. Other UT sports. Past workshops have covered soccer, volleyball, swimming and more. -Greg Cooper-Boulder, CO based action sports photographer who also shoots for the University of Colorado and the Colorado Rapids of the MLS. -Patrick Murphy-Racey, Knoxville based photographer and videographer. Patrick has shot over 600 assignments for Sports Illustrated as well many still and video shoots for national clients. Each photographer will have the opportunity to shoot with Canon professional cameras and lennses. Please note that although the workshop is sponsored by Canon it is open all photographers-regardless of the camera manufactuer they shoot. Each photographer will have the opportunity to work closely with Peter and take home hundreds of images shot with top of the line equipment. Sponsors include Canon, Dynalite, ThinkTank Photo, Hoodman and Western Digital. 18 Seats available. UT vs. BYU football. Since the game time is yet to be announced, the schedule for this day will be determined when it is. If the game is early, as I think it will be, we will head straight to the game and then do our critiques after the game in the evening. There are possibly other events taking place at UT on Sunday afternoon. Students will be credentialed, if they chose to stay around. I will be happy to critique by email or Skype. Portfolio Reviews-Steve, Pat, Greg and myself will be available to look at portfolios. Scheduling will be done at the workshop.